William Keyes, aka, Bill Keyes, is a contributor to Digital Hero and a regular at GenCon where people pose for pictures with his small stuffed rabbit, known as teh bunneh. 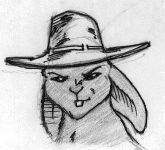 None other than Hero System Line Developer Steven S. Long kidnapped teh bunneh briefly. Bill Keyes is one of the Art Directors for Hero Games, having done layout, AD, and design on Lucha Libre Hero, the Hero System Basic Rulebook, and Hero System Martial Arts.